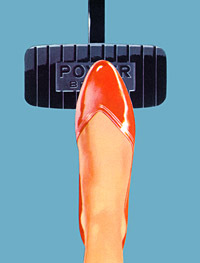 American Brake Shoe, 1956 #1. Plan59 fine-art giclee prints are made on museum-quality archival paper (see list at right for available sizes) with eight-color inks. Dimensions are Width x Height in inches. "Weight" indicates paper weight in grams per square meter (gsm) or pounds per standard ream (500 sheets). Prices are in United States dollars (USD) and do not include shipping & handling. Shipping & handling charges are assessed on a per-order basis, for the first item in each order: United States $7; Canada $15; other countries $30. (If you live in the United States, for example, you will pay $7 for shipping regardless of whether you order one print or 10.) Secure payments with credit card or EFT are via PayPal, an eBay company. Prints are sent in extra-large-diameter (four-inch) heavy-duty mailing tubes (five-inch tubes for Grand Large prints). Please allow 2 to 3 weeks for delivery from Payson, Arizona USA. Prints may be returned for a refund minus shipping costs if returned within 10 days of delivery in the original mailing container. After you place your order, you should receive an automated acknowledgment via e-mail within a few minutes. 13 x 19 inches (image size 11 x 14.5 inches) on 19 mil Museum-Grade Art Paper. 100 percent cotton rag, acid-free paper made in France. Weight: 230 gsm; Thickness: 19 mil. Imported mould-made art paper with a herringbone pattern makes for truly gorgeous prints. Very heavy (similar to poster board in thickness but much nicer). 17 x 22 inches (image size 15 x 19.7 inches) on 19 mil Museum-Grade Art Paper. 100 percent cotton rag, acid-free paper made in France. Weight: 230 gsm; Thickness: 19 mil. Imported mould-made art paper with a herringbone pattern makes for truly gorgeous prints. Very heavy (similar to poster board in thickness but much nicer). 24 x 30.6 inches (image size 20 x 26.6 inches) on 19 mil Museum-Grade Art Paper. 100 percent cotton rag, acid-free paper made in France. Weight: 230 gsm; Thickness: 19 mil. Imported mould-made art paper with a herringbone pattern makes for truly gorgeous prints. Very heavy (similar to poster board in thickness but much nicer). VERY LARGE FORMAT: 46 x 36 inches on 19 mil Museum-Grade Fine Art Paper. Allow three weeks for delivery in the United States; non-U.S. orders may take longer. Printed on-site with eight-color Ultrachrome inks. GRAND LARGE FORMAT: 57 x 44 inches on 19 mil Museum-Grade Fine Art Paper. Allow three weeks for delivery in the United States; non-U.S. orders may take longer. Printed on-site with eight-color Ultrachrome inks.